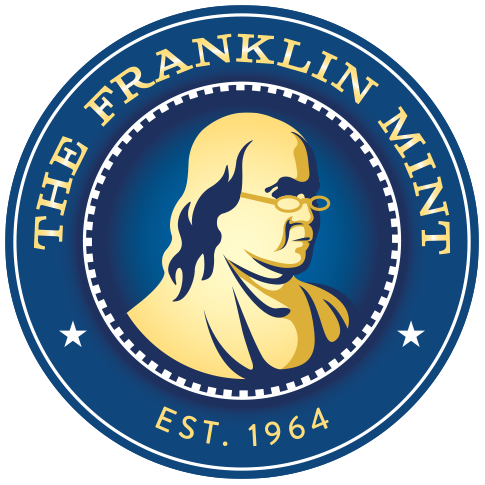 All of today’s coins and bank notes feature the motto “In God We Trust” – but at one time, the motto was not included in the designs. During the Civil War 150 years ago, Congress mandated that “In God We Trust” had to appear on the nation’s money. 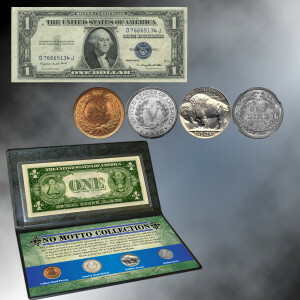 Not all coins and bank notes were quick to adopt the motto, and this collection brings together four of the last coins and one of the last bank notes without the motto. The Indian Head Penny, Liberty Head Nickel, Buffalo Nickel, and Barber Dime were among the last coins without the motto. Some were last made over 100 years ago. “In God We Trust” was first added to $1 bills during the Series 1935 Silver Certificates. This collection includes a $1 Silver Certificate without the motto. All of these items are long out of issue and are seldom seen – especially in fascinating sets like this. 7 1/2" x 4" x 1/4"